They Gathered at "The Grove." The name "Council Grove" originated from treaty negotiations conducted here in 1825. The treaty, forged between U.S. commissioners and Osage Indian chiefs, granted whites safe passage along the Santa Fe Trail. The site of Council Grove was a camping and meeting place for native Americans, explorers, soldiers and Santa Fe Trail traders. Here they found ample water, grass and abundant wood due to the extensive groves of hardwood timber. As a rendezvous point for caravans moving west on the Santa Fe Trail, Council Grove provided both Hispanic and American travelers an opportunity to repair wagons and secure provisions in preparation for the long overland trip to Santa Fe. The Kaw (or Kansa) Indians lived in three villages located three, seven and ten miles southeast of Council Grove from 1848 until their removal south to Indian Territory in 1873. 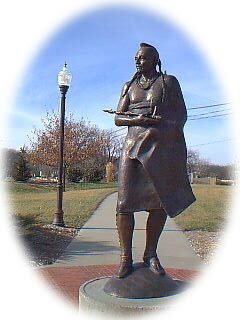 Noted personalities such as John C. Fremont, Kit Carson, General Custer and the great Kaw chief, Al-le-ga-wa-ho, are associated with Council Grove. Town founder Seth Hays was the great grandson of Daniel Boone and Kit Carson's cousin. Today the famous "Hays House" restaurant still operates in the store building constructed by Seth Hays in 1857. Because of efforts to preserve our many historical buildings and sites, Council Grove offers visitors an encounter with Authentic western American history.